The Stampede collection Blackberry leather-match 3 piece power reclining sectional sofa features top grain leather with easy maintenance, durability, and longevity. Extra wide seating with premium seat cushions makes this the perfect seating solution. The stunning "blackberry" is a deep brown with a hint of burgundy. It includes a power reclining sofa, power reclining console loveseat, a and seating wedge. Leather-match is high-quality leather on the front with leather performance fabric on the sides and back. You and a buddy will enjoy the big game on this blackberry leather-match sofa. With two reclining seats, you'll each be able to kick back and scream at the players and referees to your heart's content. Bring a plate of your favorite hot wings and nachos and you'll have the perfect night! 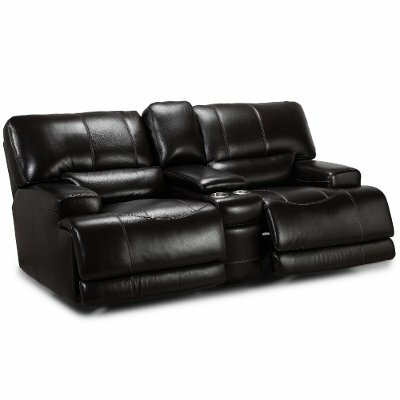 You and your best friend can enjoy the big game on this blackberry leather-match power reclining loveseat with console. With two reclining seats, you'll each be able to kick back and scream at the players and referees to your heart's content. It's a durable piece, built to hold up to 450 lbs per seat. The stunning "blackberry" is a deep brown with a hint of burgundy. Bring a plate of your favorite hot wings and nachos and you'll have the perfect night! 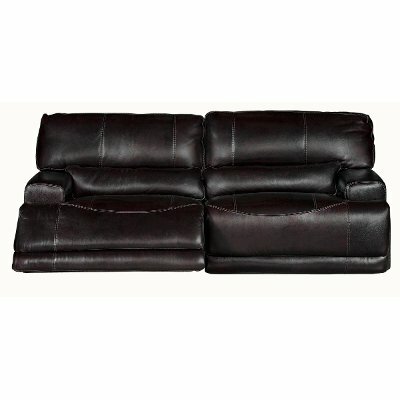 Blackberry 3 Piece Power Reclining Sectional Sofa - Stampede is rated 5.0 out of 5 by 7. Rated 5 out of 5 by Firstleathercouch Very Comfortable We bought the sofa and love seat. Only had it a week but it is very comfortable. The easy touch buttons for the recliner are great. We love that the couch is split down the middle so it's a very large seating area when you recline. Definitely happy with our purchase. Rated 5 out of 5 by Snowfam Best Ever We purchased the couch, loveseat, and club chair! We paid up for this most comfortable set! It's the best. Lumbar support, along with the ease of reclining, makes this one comfy set! We purchased back in march, and I'm so glad we did! Our friends had purchased the couch and love seat. We fell in love with theirs, so decided to get our own! Rated 5 out of 5 by ShopsatRCWilley Still looking as great as when we first purchased! We purchased our sofa recliner two years ago and The motor/recliner is still working perfectly. This leather sofa looks like brand new and we use it daily. Rated 5 out of 5 by boymomof4 We love this sectional Great quality! we bought it 5 months ago and it has been trampled on by 4 kids, still looks great and is solid. Rated 5 out of 5 by comfypeople love this set purchased this sofa a month ago and are very happy with it. lumbar support makes it the most comfortable I have sat in. Rated 5 out of 5 by cjurek Love it!! I really really love this sectional. It is beautiful, durable and very very comfortable. Rated 5 out of 5 by Henry2011 Mrs Very comfortable, power recline buttons are easy to use and in a convenient place.